This month we're giving away a pair of Jaybird X2 wireless earbuds as well as take a look at some of the cooler things that happened over the past month. This month wasn’t the hottest we’ve seen in terms of new products, but there were some interesting things to happen. Jaybird is now owned by an even larger company and there’s a Kickstarter for headphones that are supposed to help you relax? This is Sound Guys Monthly. Fluance is a company that’s always impressed us with the quality of their Bluetooth Speakers, but now they’re going a step further (or backwards) and making two new turntables. The RT80 and RT81 are similar in more ways than they are different. The biggest difference is probably the needle used, with the RT80 using an AT91 needle and the RT81 using the AT95 needle. Both are made from Audio-Technica which is known for good needles and both accept 33 1/3 and 45 RPM LP’s and EP’s. In a weird twist the company made a Kickstarter to fund the project and we’re happy to hear that it was successful. Jaybird, the company that makes the infamous wireless workout headphones, is now a part of Logitech. So how much is a company like Jaybird worth? Well Logitech bought them for a whopping $50 million, with another $45 million incoming if Jaybird meets their projected growth rates. Now Logitech can add a trusted brand like Jaybird to the list of audio companies it owns, like Ultimate Ears who make the UE Boom. The Jaybird X3’s are Freedom wireless headphones are still set to come out soon, but how will future Jaybird products look? we’ll have to wait to find out. B&O is no stranger to Bluetooth speakers, but this one is just a little different from what we’ve seen before. The Beoplay A1 is made to look pretty sure, having been deigned by designer Cecelia Manz, but it’s also made to be their first durable Bluetooth speaker. It’s small enough to carry around on a day out, has a solid aluminum build, and an insane 24-hour battery life. B&O says this speaker was made so that “every scratch tells a story” so if you want to tell your own story, you can get them from their website in natural silver or moss green for $249. Keeping with new products, Harman Kardon has announced the Go+ Play speaker which has an all black design and a very conspicuous handle. It’s meant to be portable, but considering the size and the 5 hour battery life it seems more like it was meant for home offices or conference rooms. Still, I suppose you could carry it along with you like a picnic basket. In the past we’ve seen headphones that can track your heart rate and cure VR motion sickness, but these headphones from Melomind aim to help you relax. Using EEG sensors in the headphones and an app, these headphones want to train your brain into relaxing more. While wearing the headphones the app will provide different sound stages that reflect how relaxed you are. But besides that, they’re also just a regular pair of really comfortable headphones. Still with only a 6 hour battery life, you might not to make these your next purchase. If you’re interested make sure to check out their Kickstarter campaign. 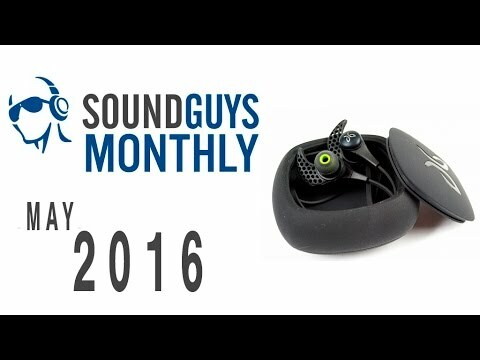 This past month was a fun one for us here at Sound Guys, and we got to review a bunch of great products. But the coolest of them had to be the LG Tone Platinums. If you’ve ever used a pair of headphones in the LG Tone series before, you know what to expect here. Still, these did a good job impressing Joshua Vergara from Android Authority who did the review for us. They have a solid build, strong connection, and were able to last him anywhere from 3-5 days between charges with average usage. They’re not yet released, but definitely check out the full review to get a better idea of how they are. These aren’t exactly inexpensive, but they’re a great value, making the Fluance Fi70 our bang for your buck pick. Yes, this speaker does cost $499, but it sounds great. It’s not portable at all and meant to have a permanent spot in your living room somewhere, but if you have the space it’s worth it. The speaker has touch sensitive controls on top and comes with a remote for when you don’t want to get off the couch. Overall, we were very impressed with this speaker and it’s worth checking out if you want to get into home audio for cheap. We have best lists for days on Sound Guys, but with summer coming up we thought we’d recommend our list for the Best Waterproof Speakers this month. If you’re going to be near beaches, pools, or even sprinklers, a good waterproof speaker can be the life of the party. In our list we have some options for portable and stationary speakers all able to withstand an electronics worst enemy: water. Make sure to check it out if you’re looking for something to play all of your summer jams. Ok so now we’re up to the giveaway. Last month we were giving three CB3 Ultra Slim Bluetooth speakers to three different people. Those winners are Guilherme Y (Brazil) Matheus A (Brazil) Brendan L (Europe). Congratulations everyone on your slim new speaker. Now for this month we’re giving away another pair of Jaybird X2’s because who doesn’t love them? Just follow the links below to enter below and as always the giveaway is international. Good luck everyone. JayBird x2 Bluetooth earbuds International giveaway!